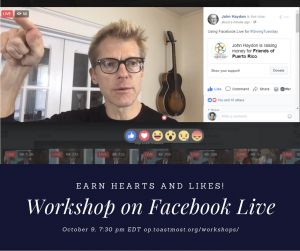 We hope to have a good audience for our Facebook Live workshop Monday at our regular meeting time, 7:30 pm EDT (formal meeting starts at 8). As a warmup, Online Presenters President David F. Carr will be doing his own Facebook Live program today at 4 pm EDT to share his tips about marketing events on the web and social media. To register for Monday’s workshop, visit op.toastmost.org/workshops/ – timezone conversions are shown on that page. In addition to covering techniques specific to WordPress and the RSVPMaker events management plugin, David will be talking about a variety of other techniques for online promotion. (Yes, this is David writing about himself in the third person. Sorry about that).